« 2010~The Year of the Liberator~March 31, 1945-U.S. Troops Investigate Hadamar euthanasia center. 2010~The Year of the Liberator~Early April 1945: The SS evacuates thousands of Jews*. The SS evacuates thousands of Jews–mostly on foot–as Allied and Soviet forces press in from the east and west. 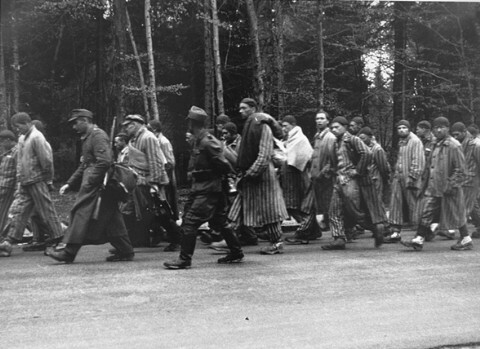 Evacuees are taken to camps at Bergen-Belsen, Germany; Dachau, Germany; Ebensee, Austria; Leitmeritz, Czechoslovakia; and Theresienstadt, Czechoslovakia. The operation is rife with daily beatings and murders as well as deaths from starvation and typhus. Thirteen hundred Jews are evacuated on foot from Vienna; only 700 will reach their destination, the Gusen, Austria, camp, alive. April 1, 1945 – The Red Army liberates Sered labor camp in Slovakia. The first UNRRA (United Nations Relief and Rehabilitation Administration) teams enter Germany in the wake of the Allied armies to facilitate and assist in the relief of the displaced persons. April 1, 1945: The SS initiates death marches to evacuate the concentration camps at Dora-Mittelbau and Kochendorf, Germany. April 3, 1945: All 497 members of a slave-labor group at Bratislava, Slovakia, are shot and killed by their captors. The Nazis evacuate the concentration/slave-labor camp at Nordhausen, Germany.